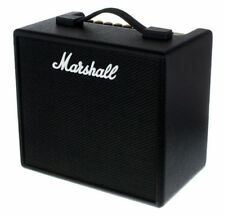 The amplifier pictured is the actual amp you will receive! It includes Delays with Tap Tempo, and studio quality Reverbs. CODE features EL34, 5881, EL84 & 6L6 MST power amp voicings, and MST speaker cabinet models: 1960, 1960V, 1960AX, 1960HW, 1936, 1936V, 1912 & 1974X. 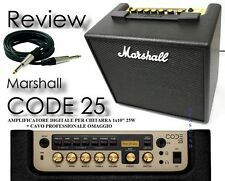 Marshall Electronics CODE 25 is a fully programmable combo amplifier developed in collaboration with audio software pioneers Softube. The 24 FX include compressor, classic stompbox Distortion, Auto Wah, Pitch Shifter, Chorus, Phaser, Flanger, and Tremolo. Fully programmable via your phone and online, CODE25 is the amp for on the go. Speaker model: Custom (4Ω, 25w). All originally included accessories, manuals, and software must be included. 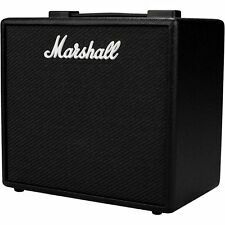 Marshall Code 25 Modeling Guitar Amplifier Combo at a Glance Marshall Code 25 Modeling Guitar Amplifier Combo Features Re-creates decades of classic Marshall preamp/power amp/speaker cab combinations. Mit CODE kannst du zwischen all deinen Lieblingssounds wählen. Dabei ist CODE komplett programmierbar. 100 Presets lassen sich bearbeiten und speichern. 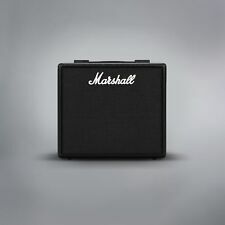 MARSHALL Code 25. Juri-Gagarin Ring 1. [ Leistung: 25 Watt. ]. It has 24 FX including: Compressor, classic stompbox Distortions, Auto Wah, Pitch Shifter, Chorus, Phaser, Flanger and Tremolo. It includes Delays with Tap Tempo, and studio quality Reverbs. FX 24 (5 SIMULTANEOUSLY). 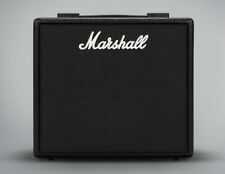 Up for sale is a great sounding Marshall Code 25 Amp. Tested and in great working order. 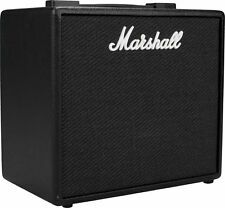 Great Marshall tone. Gently used and in great shape. Includes power chord. Make sure this fits. by entering your model number. Item model number: CODE25. 14 preamp models. 24 pro quality FX. 4 power amp models. 100 user editable presets. 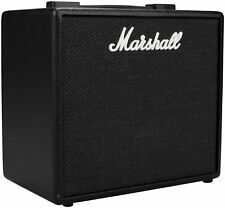 The Marshall CODE range combines the Marshall legacy with state of the art technology, culminating in their most versatile and impressive digital product ever. Add from a selection of 24 FX and you have all you need in one complete setup. Bluetooth Capabilities. Date First Available: 23 Jan. 2016. 25 Watts of Pure Power. 24 Different Types of Effects. 100 Presets to Choose From.